AAP-OC’s Injury and Violence Prevention Initiative provides expertise, evidence-based guidelines and public policy advocacy for childhood injury and violence prevention. Our goal is to reduce childhood injuries in Orange County. Injury, both intentional and unintentional, is the leading cause of death and disability in the United States for children beyond the first year of life. These injuries will have lasting impacts, including total lifetime economic costs of more than $50 billion in medical expenses and lost productivity. Injuries can be prevented through enabling system changes (public policy and laws, environment and engineering), as well as changes in community and individual behaviors. Choose from a wide variety of materials and media that the Injury and Violence Prevention Program has to offer pediatricians and other child health specialists. Standardized drowning surveillance can be used to monitor trends and identify risk and protective factors in order to set priorities and guide drowning prevention policies and strategies. 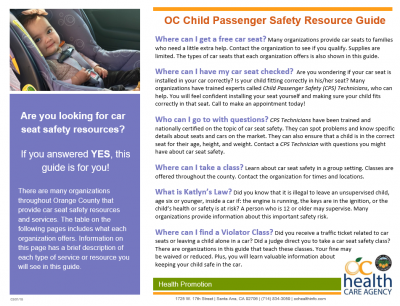 For more information, visit the Orange County Health Care Agency website. The American Academy of Pediatrics, Orange County Chapter with support from The Allstate Foundation implemented the Teen Safe Driving Program with the goals of increasing awareness regarding the Graduated Driver License policy, and to reduce teen driving deaths. The national AAP released its first policy statement recommending Graduated Driver Licensing (GDL) laws in 1996 in response to the high number of fatalities and injuries among teen drivers. As a result of over 15 years of pediatric advocacy, all 50 states and the District of Columbia have a 3-tiered Graduated Licensing System for teen drivers. These include a learner’s permit, an intermediate or provisional license, and a full-privileged driver’s license. Unfortunately, the strength of these laws varies widely, with some states adopting more stringent provisions than others in specific areas such as the number of required hours of supervised behind-the-wheel training and restrictions on night time driving, teenage passengers and mobile phone use. (For a full description of recommended provisions and state-by-state requirements, click here.) Currently no state has a law that meets all the AAP recommendations for teen driving safety.